We all have that unit. The one you painted years ago and now need to add to or update. 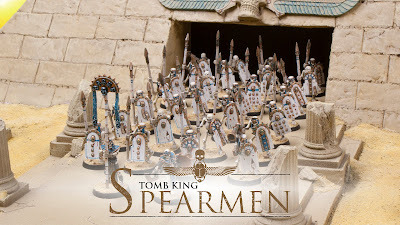 For me that's my Tomb King spearmen. With Adepticon looming I decided to bulk the unit up from 16 to 30, which meant trying to make everything look cohesive and at the same time, up to date. 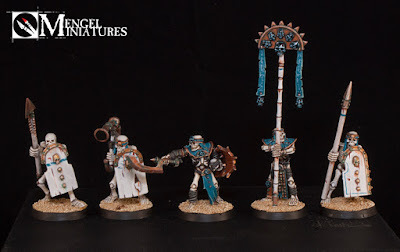 This is the tricky part, because not only have I improved as a painted since I painted the original 16 models, but my style and techniques have also changed slightly. The first group was probably painted sometime around 2012. 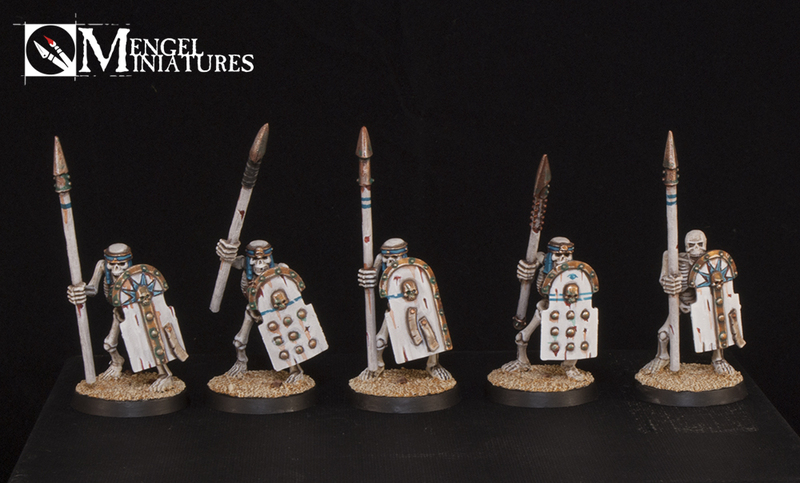 My Tomb Kings(TK) were originally meant to be a fast and quick army for me. I was going to put the time in on the characters and center piece models, but the rank and file were just going to be a passing grade. That meant a lot of dry brushing on the bone, which doesn't look horrible, but would make my OCD painting style cringe today. 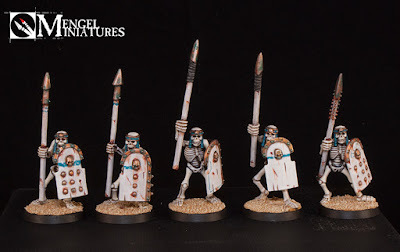 I had painted up some archers a few months ago, so I had already figured out the "new" was I was going to paint rank and file guys. 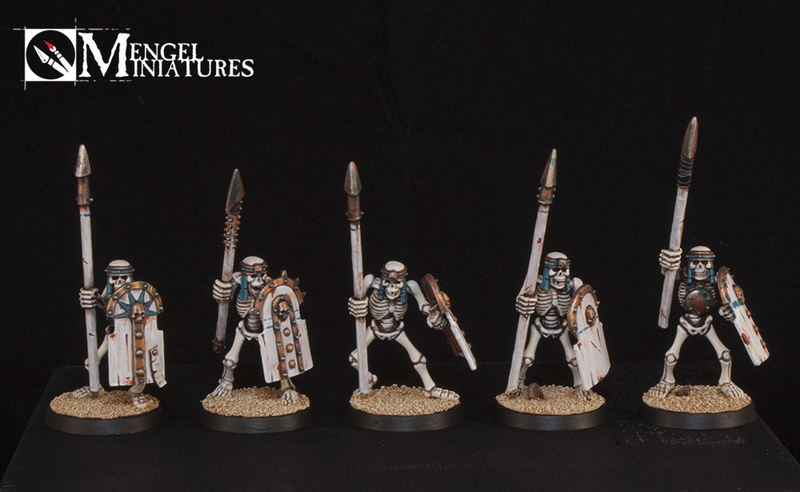 The bone was base coated with Screaming Skull, washed with Agrax Earthshade, and then hit with a dry brush of a Screaming Skull/White mix. 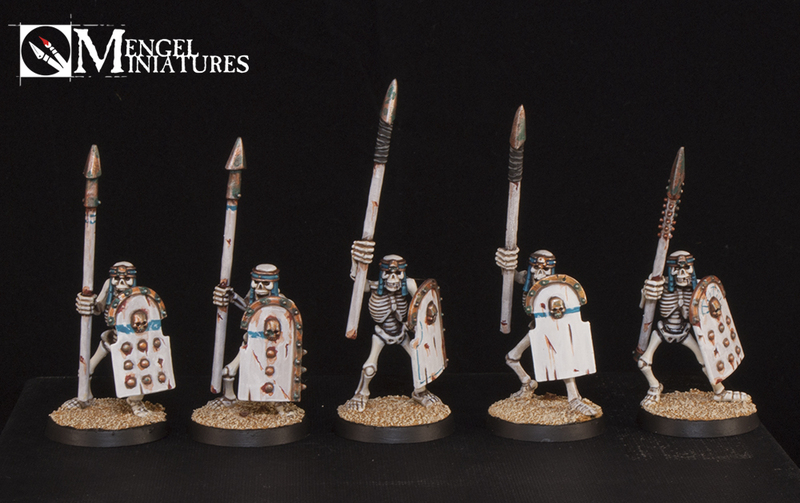 On the old spearmen this was then followed up by a very select final line highlight of pure white, and that was that. I tried doing that again and just couldn't stand the look of the dry brushed bone, it was way too messy for me. Now I go back over the dry brush with a layer of the same mix to neaten it up. I basically use the dry brush as a guide for where to paint. I do leave it alone in a few areas such as hard to reach spots, areas that will be mostly covered up in the end anyway, and sometimes on fingers, toes, or ribs, depending on how it turned out. This is then all finished up with an all over final line highlight of pure white. 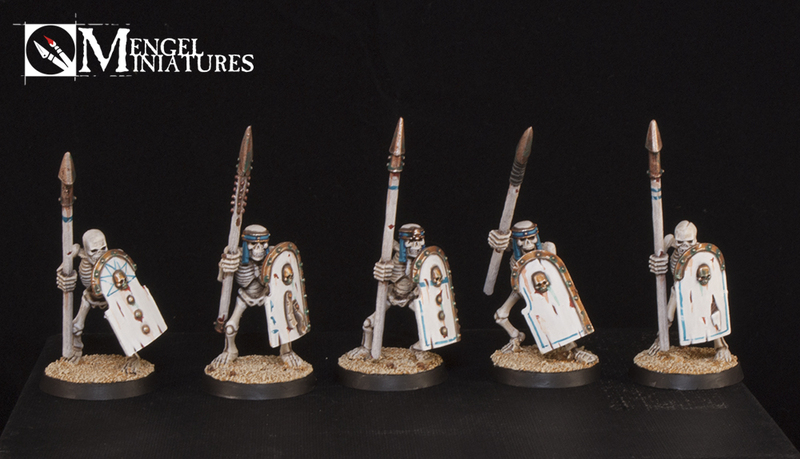 It keeps the same general look of the older models, but is much cleaner looking. When working with sculpts that haven't aged well, a nice clean paint job can do a lot to make it look more up to date then it really is. 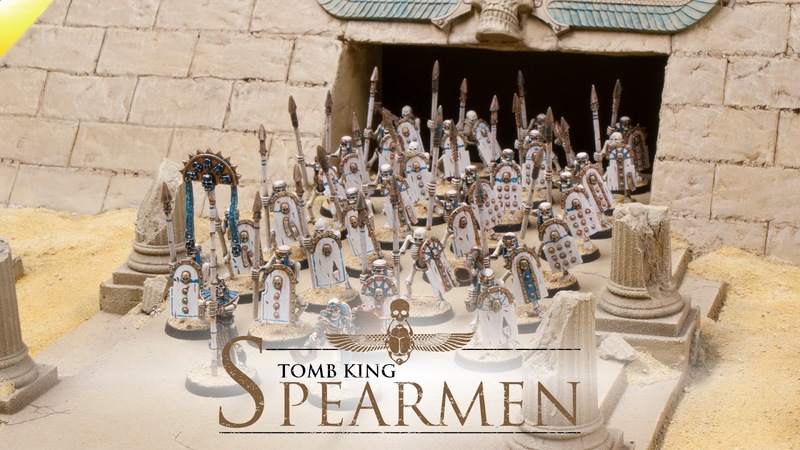 Another issue I faced is that the old spearmen were all painted with the old color range. Luckily for me I have had months of practice on color matching everything as close as I can as I run through my old paints. The spears and shields match pretty closely in my opinion and my painting technique on them hasn't really changed. The only difference is that I'm a little neater with my metallics now. When I built all of the new additions to the unit I discovered that I was two models short of 30. 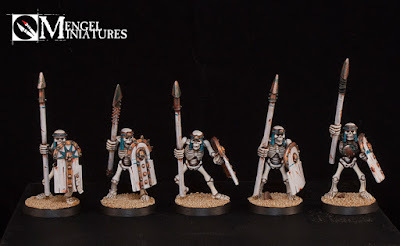 Luckily I have some extra finecast models from the Casket and Catapult. Parts of my original ones had been miscast, so I have been sent replacement parts which left me with extras. My original champion and standard bearer for the unit were retired to rank and file duty to make room for the new ones. I simply broke their sword and banner carrying arms off and replaced them with a spear, which I had plenty of. The new arms had to be painted, but they blend in seamlessly. I had my idea for the new champion immediately. The champion from the Catapult is a great sculpt and in a terrific leading pose. I simply took a spare shield from the Tomb Guard kit and slapped it on his other arm. The standard bearer was a little more difficult. Nothing came to mind right away so I took a dive through my bits box. The Casket Guard are in a great pose for someone who looks like they won't budge. They also have both of their hands clasped around the hilt of their sword directly in front of them. Perfect. I cut the sword out from the hands and drilled a hole all the way through them for a pin (paper clip). I then took a spare spear from the warsphinx kit and cut it to the lengths I needed, this became the banner pole and fit the new TK aesthetic a lot more then the old one. The banner top is just one from the warrior box. I think this guy is one of my favorite TK models. All together the unit looks great! I love how many guys are in it, and seeing all of those spears ranked up. 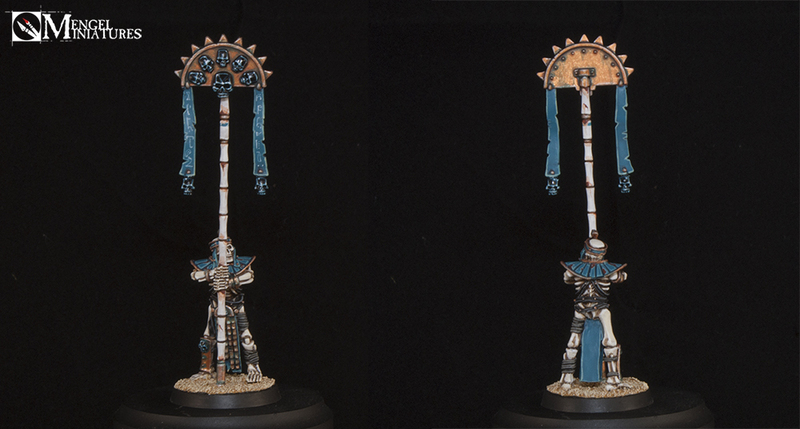 This is what the TK are all about, giant phalanxes of rank and file warriors. It almost make me want to pick up another box of warriors before they're gone just so I can add more to my archers in the future. I don't know if I will though, since it took me four years to add to this unit. Now my spearmen march to war, ready to unleash the king's vengeance upon the living. Onward, to Adepticon!